Quilt Market, that wonderful event that brings fabric designers, fabric companies and seamstress who love fabric together is coming up soon, and I had the wonderful opportunity to sew some items for the Michael Miller booth from my friend Hayley’s Color Me fabric line. This is the second set of designs for this black and white fabric that can be colored using fabric markers. 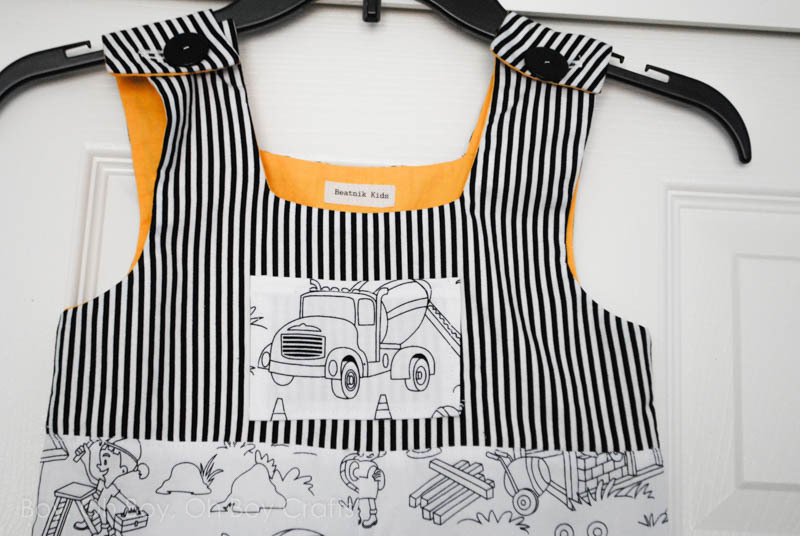 The whimsical prints are great for personalizing items and the kids just love coloring a garment that’s been sewn just for them. 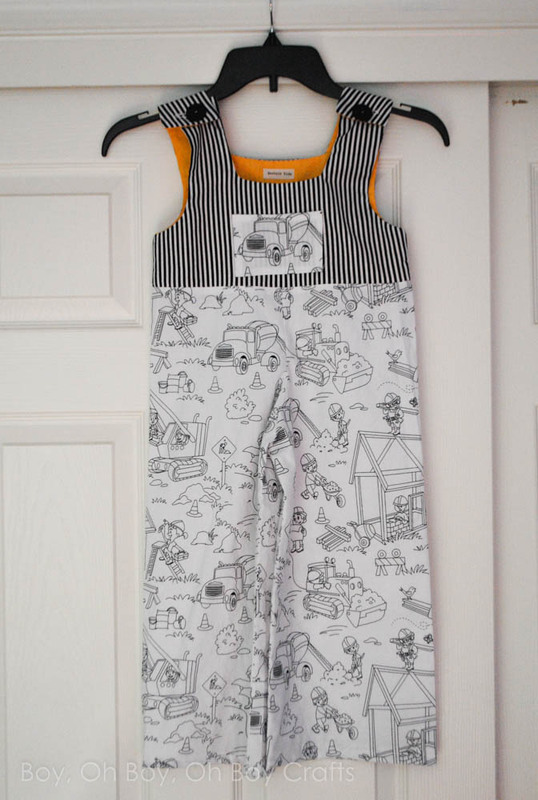 As soon as I saw her Building Fun print, I knew I wanted to sew up a pair of overalls. Read on to grab the free overalls pattern! Since the actual pair is off to Michael Miller headquarters, getting ready for Quilt Market, not to mention that it was made to fit a size 4 mannequin, I don’t have beautiful, model wearing photos for you. But . . . I do have the tutorial and FREE sewing pattern so I’m hoping that makes up for it. 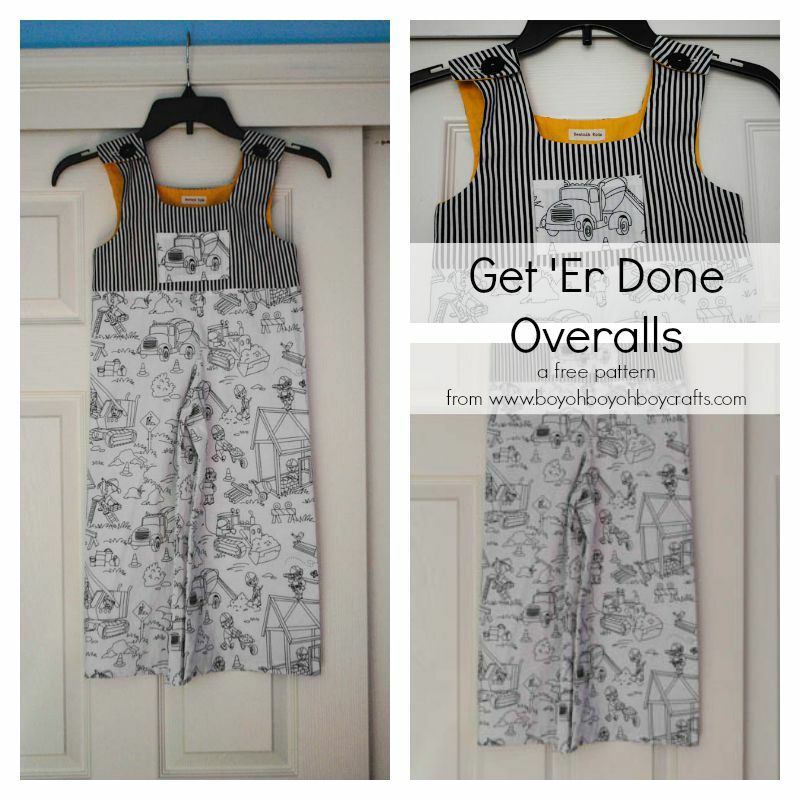 Here’s how to sew up a pair of these fun overalls! Preparation: Cut all pattern pieces plus a 3 X 5 inch rectangle if including a pocket. Iron two 1 X 1 inch squares of fusible interfacing to the back bodice “straps” where the button holes will go. Step 1: Place the two back pieces, right sides together, pin and sew starting at the left-hand corner of the arm scythe and continuing around the top portion of the bodice using a 1/2 inch seam allowance. 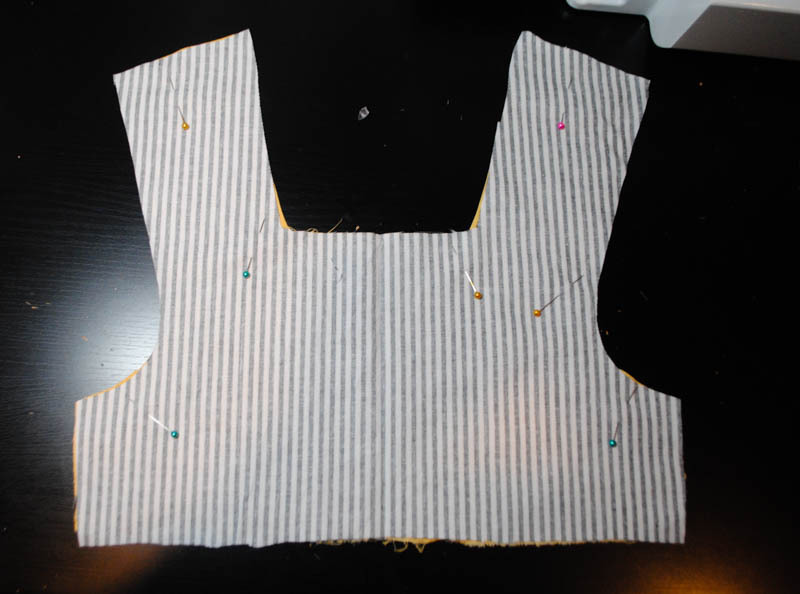 Repeat for the two front bodice pieces. 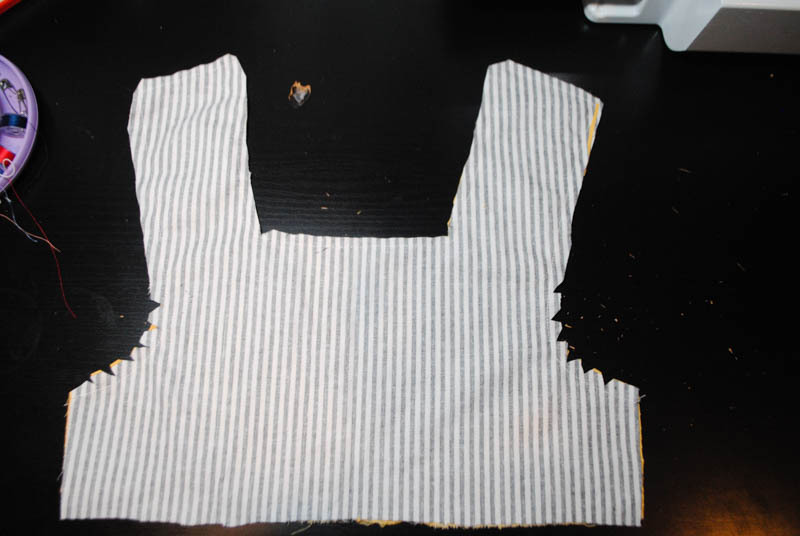 Step 2: Notch the curves, clip corners, and trim seam allowance to 1/4 inch on both the front and back bodice pieces. Then turn right side out. Step 3: Now to sew the side seams of the bodice. Open the front and back bodice pieces. Place them right sides together and match up the raw edges of the sides. 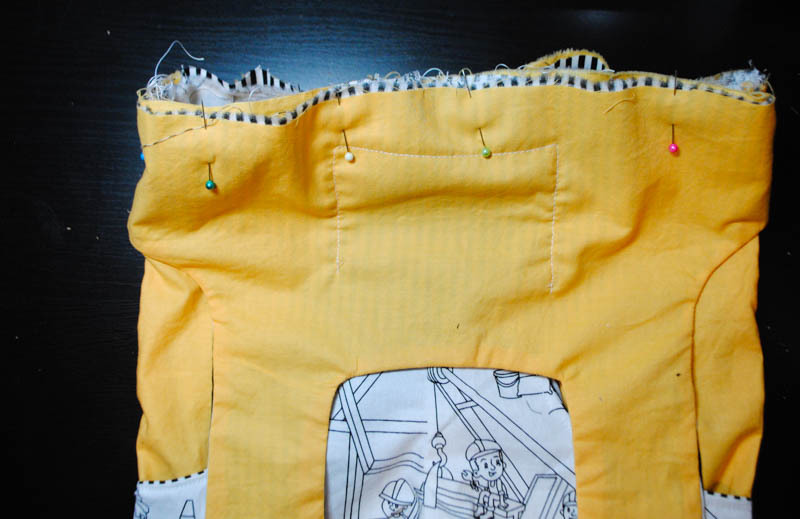 The lining pieces should be matched and pinned together and the main pieces matched. Sew using a 1/4 inch seam allowance. Repeat for the other side seam. Step 4: Sew the pants. With right sides together, pin and sew the side seam of one pant leg using a 1/2 inch seam allowance. 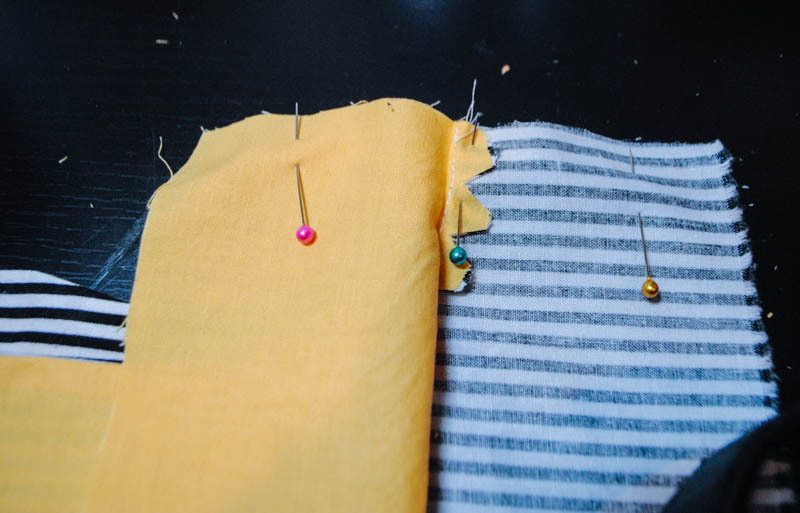 Finish the seam with a zig zag stitch or serger. Repeat with the other pant leg. Turn one pant leg right side out. With right sides together, place one pant leg inside the other. Pin the raw edges matching up the seams. Sew using a 1/2 inch seam allowance. Finish the seam. Step 5: Turn the pants right side out. With right sides facing, slip the bodice over the pants, matching the raw edges, pin and sew using a 1/2 inch seam allowance. Finish the seam. Flip the bodice up and press well. Top stitch the seam allowance down if desired. Add your pocket and sew the button holes and you are finished! 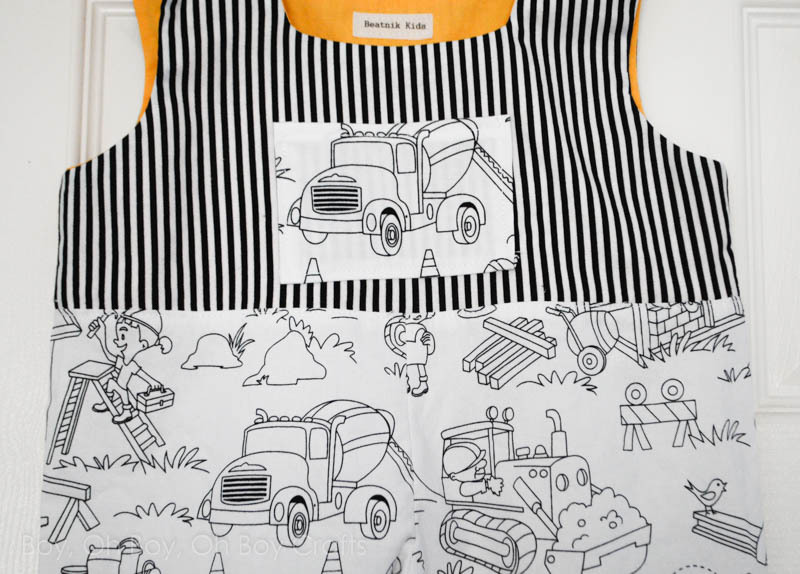 I think this fabric looks adorable even without coloring but the boys would have so much fun coloring in this darling construction design. For tips on using fabric markers check out this post! Have you sewn anything with this super fun fabric? Thank you so much! I needed a luigi overalls pattern for a very skinny 7 year old. So will probably just lengthen the legs and maybe the bodice. I have been looking around and it's hard to find simple overalls for older kids. Yay! So glad that will work for you. I’d love to see it when it’s finished. They have a bit of a drop crotch so the finished leg inseam measures 16 inches and they measure 15 inches from shoulder to crotch. 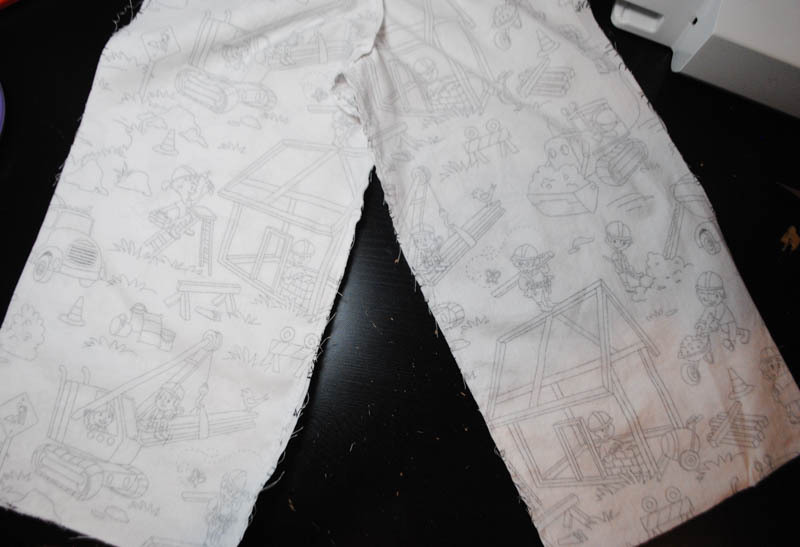 If you’re little one is tall and needs a bit more length, just retrace the pant leg onto pattern paper and then extend the leg piece as much length as you need!